Lay people and many professionals often express consternation when an individuals measured IQ scores are different at different times in their life. This concern is particularly heightened in high stakes settings where differences in IQ scores can result in changes in eligibility for programs (e.g., social security disability income) or life-or-death decisions (e.g., Atkins MR/ID death penalty cases). 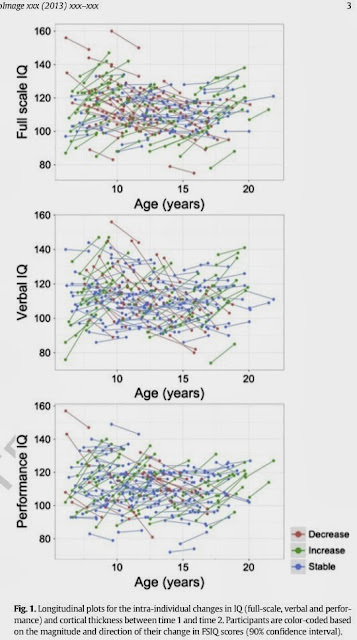 Factors contributing to significant IQ score differences are many (McGrew, in press a) and may include: (a) procedural or test administration errors (e.g., scoring errors; improper nonstandardized test administration; malingering; age vs. grade norms; practice effects), (b) test norm or standardization differences (e.g., norm obsolescence or the Flynn Effect; McGrew, in press b), (c) content differences across different test batteries or between different editions of the same battery, or (d) variations in a person’s performance on different occasions. An article "in press" (Neuroimage) by Burgaleta et al. 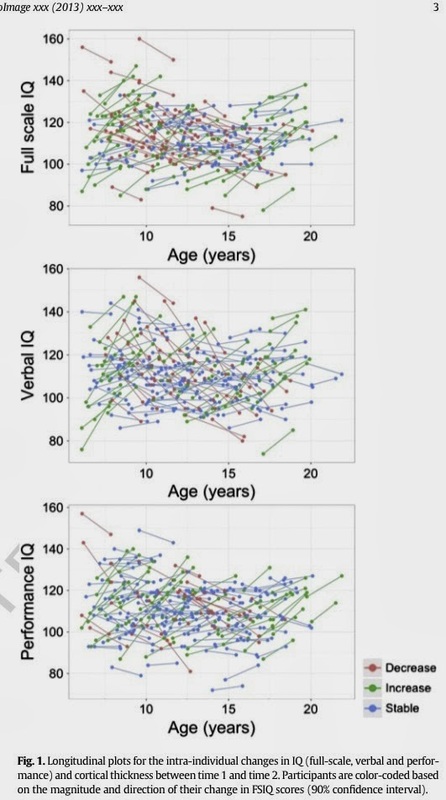 (click here to view copy with annotated comments) provides the important reminder that differences in IQ scores for an individual (across time) may be due to real changes in general intelligence related to real changes in brain development. 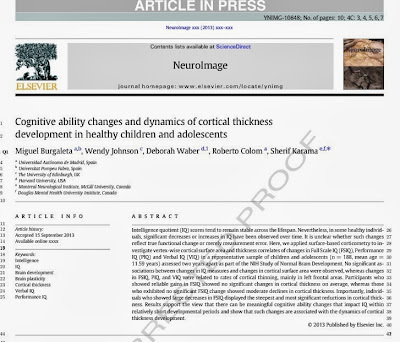 These researchers found that changes in cortical brain thickness were related to changes in IQ scores. 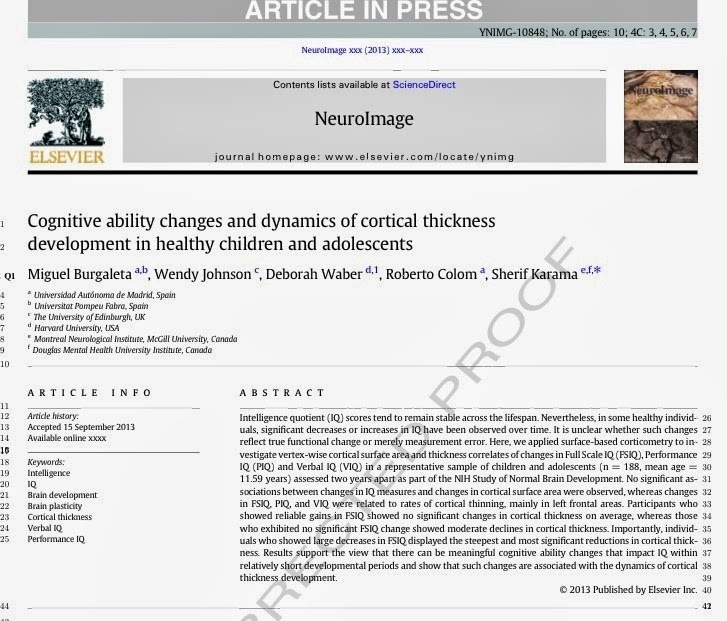 They concluded that "the dynamic nature of intelligence-brain relations...support the idea that changes in IQ across development can reflect meaningful general cognitive ability changes and have a neuroanatomical substrate" (viz., changes in cortical thickness in key brain regions). 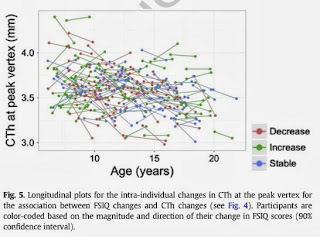 The hypothesis was offered that changes in the the cortical areas of frontoparietal brain network (see P-FIT model of intelligence) may be related to changes in working memory, which in turn has been strongly associated with general reasoning (fluid intelligence; Gf). The cortical thickness-IQ change relation was deemed consistent with "cellular events that are sensitive to postnatal development and experience." Possible causal factors suggested included insufficient education or social stimulation during sensitive developmental periods, as well as lifestyle, diet and nutrition, and genetic factors. McGrew, K. S. (in press a). Intellectual functioning: Conceptual issues. In E. Polloway (Ed. ), Determining intellectual disability in the courts: Focus on capital cases. AAIDD, Washington, DC. McGrew, K. S. (in press b). Norm obsolescence: The Flynn Effect. In E. Polloway (Ed. ), Determining intellectual disability in the courts: Focus on capital cases. AAIDD, Washington, DC. A state task force today voted to recommend that the state legislature pass a law excluding the severely mental ill from the death penalty in murder cases. The Joint Task Force to Review the Administration of Ohio's Death Penalty, a creation of the Ohio Supreme Court and the Ohio State Bar Association, wants the General Assembly to hold hearings and pass a law to prevent people who have a severe mental illness, such as schizophrenia, at the time of the crime from facing the death penalty. The aim is not to stop them from being prosecuted, however. Despite the vote, there is a deep divide among task force members about what constitutes serious mental illness and whether the current legal system does an adequate job of screening for it. "I don't want everyone with ADHD or some real or imaginary disability to avoid responsibility," said state Sen. Bill Seitz, R-Cincinnati, a task force member who voted for the proposal but with reservations. Hamilton County Prosecutor Joseph Deters said the court system screens out the seriously mentally ill through the trial and appeal process. "We are producing more and more layers of litigation in capital cases that I think are unnecessary." John Parker, a Cleveland attorney whose subcommittee recommended the exclusion, reasoned that the legislature, not the task force, is best equipped to decide what he admitted will be a contentious issue after hearing from law enforcement, prosecutors, the public defender, mental health experts and others. The task force was motivated to make the proposal by former Ohio Supreme Court Judge Evelyn Lundberg Stratton, a longtime advocate for the mentally ill, who recommended when she was on the court two years ago that the "time had come to re-examine whether we as a society should administer the death penalty to a person with a serious mental illness." The task force, which convened nearly two years ago, will wrap up its meetings in November and begin drafting a final report to the governor and state legislators to be submitted next year. Miranda Rights Comprehension Instruments: A Critical Review, Frumkin, I. B.; Sellbom, M.
News story re Atkins cases in GA. Thanks to Kevin Foley for sending me copies of these two recent Atkins decisions. Pizzuto v Idaho (2013). A 2012 decision for Pizzuto can be found here. They will be added to the Court Decision blogroll. Copy of decision to be posted in the next few days at this blog. More than six years ago, it appeared that condemned Santa Clara County killer David Allen Raley had run out of legal options to avoid execution. After two decades of appeals, the U.S. Supreme Court had rejected Raley's seemingly final challenge to his 1988 death sentence for murdering a Peninsula teenager and attempting to murder her high school friend. But as is often the case for California's death row inmates, Raley's legal odyssey is far from over. Armed with a new order from the California Supreme Court, Raley has revived his appeals with a claim that he was mentally retarded at the time of his 1985 crime -- a finding that would spare him from execution under a 2002 U.S. Supreme Court decision. On Monday, Santa Clara County Superior Court Judge Linda Clark will start a special two-week hearing in Raley's case, which among other evidence has raised the unique claim that he is autistic and therefore falls under the legal protections against executing the mentally retarded. Clark will issue a recommendation to the state Supreme Court, which will make a final decision on Raley's fate. In court papers submitted to Clark, prosecutors branded Raley's argument a belated legal Hail Mary to avoid lethal injection and scoffed at the suggestion he is mentally disabled, noting his IQ tests were never below the standard threshold for mental retardation. "(Raley) acted alone in committing these horrible crimes and the facts elicited at trial show evidence of premeditation, cunning and problem solving, all characteristics inconsistent with a diagnosis of intellectual disability," prosecutors wrote. Raley's case is part of an increasingly common legal battle unfolding in recent years in California and other death penalty states, the result of the U.S. Supreme Court's ruling that it is unconstitutional to execute the mentally retarded. The high court left it to the states to sort out which death row inmates or defendants facing capital murder charges may fall under the murky definition of mental retardation, forcing courts to grapple with evaluating whether there is clear proof of the disability before the age of 18. Death penalty supporters say claims such as Raley's are contributing to the legal morass. "The fuzziness in the definition of retardation" has given death row inmates another avenue to contest their sentences, "even though generally meritless" said Kent Scheidegger, legal director of the pro-death penalty Criminal Justice Legal Foundation. But Raley's supporters say his case is an example of the state spending too much time and money on the death penalty. The American Civil Liberties Union cites his mental disability and costly appeals as reason to abandon capital punishment. "He's not the worst of the worst," Bacon added. "The interests of public safety could be served with life in prison without the possibility of parole." Two Vanderbilt professors part of PBS series "Brains on Trial"
A new study on the now "old" WISC-III which still provides insights into the debate regarding what the Wechsler Arithmetic subtest measures. Consistent with research I have coauthored and my analysis of other studies (click here to view), this new study is consistent with the classification of Arithmetic as primarily a measure of quantitative reasoning.